We had returned from Rhode Island the night before, where we had been immersed in locavore creative cookery, so my visit to the Union Square Greenmarket the next day was even more burdened with the weight of responsibility than usual. I should have been intimidated by the fantastic meals we had enjoyed from the kitchens of Derek Wagner (Nick’s on Broadway, as well as the oyster farm dinner the day before), and Ben Sukle (Birch). In fact I wasn’t, mostly because, after five days away from my own kitchen, I was so anxious to re-visit the bounty of our home counties. 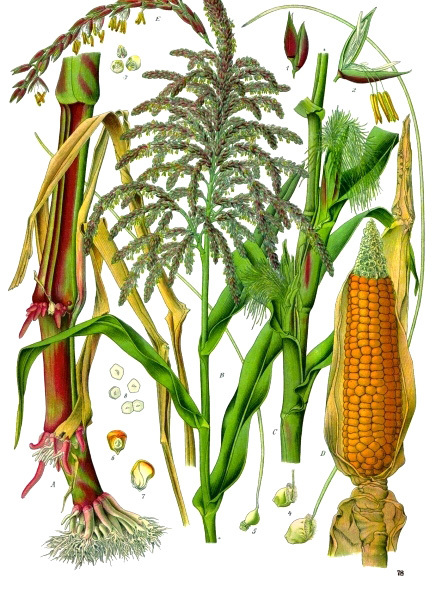 Among the many pleasures we encountered in Rhode Island which were uncommon or unheard of on our New York table, was the appearance, several times, of sweet corn, even more sweet husk cherries, and somewhat sour tiny cucumbers, shaped and colored like watermelons. At the Greenmarket on Saturday my only deliberate purchase, other than the fish, was some corn (a vegetable whose origins are Mexican); the fact that I also brought home husk cherries and sour gherkins (both of Mexican origin) was totally fortuitous. I had no plans to put them together with the maiz, but when I looked on line for ideas for serving corn (off the cob, of course), the first suggestion was to combine it with Physalis pruinosa and the little gherkins, or ‘Sandita‘. It looked like a natural, and I had just the right amount and proportion of each ingredient. 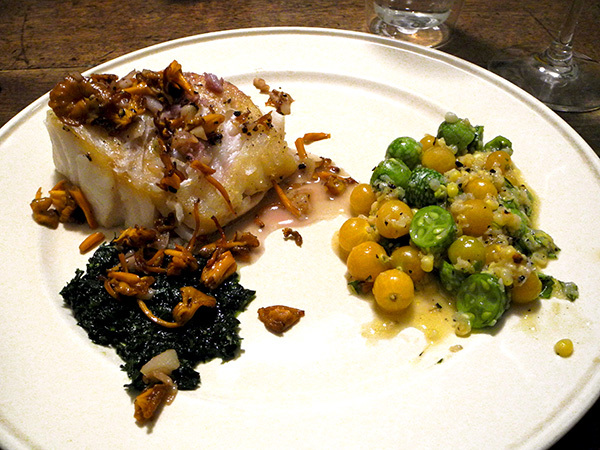 As far as the fish portion of this meal is concerned, while cod is not found in the warmer waters of either the Gulf or the Pacific, there are a number of other white fish in those oceans. I had also picked up less than two ounces of chantarelle (girolle) mushrooms at the Greenmarket, not knowing until later in the evening what I would do with them (Mexico does have an exact equivalent to the chanterelle mushroom). Mexican cuisine would be more likely to incorporate cilantro than parsley, but I used Italian Parsley here because I had not planned ahead. My dinner was now fully conceived. Even the wine had a Mexican connection, the parents of the vintner, Dalia Ceja, were field workers who became the first Mexican-American winery owners in Napa and Carneros. 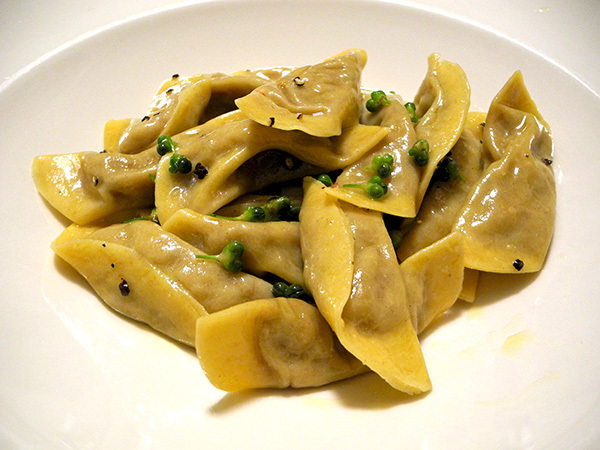 These traditional little Lombardy ‘dumplings’, shaped, as described in a Wikipedia entry, as ‘sweet wrappers’ (the filling is generally slightly sweet), were displayed in the fresh pasta glass case at Eataly when I stopped by on Friday to tell Luca how much we had appreciated his wonderful gnocchi the night before. I already had plans for dinner that evening, but I decided I’d come back for them the next day. I did, and we were not disappointed. 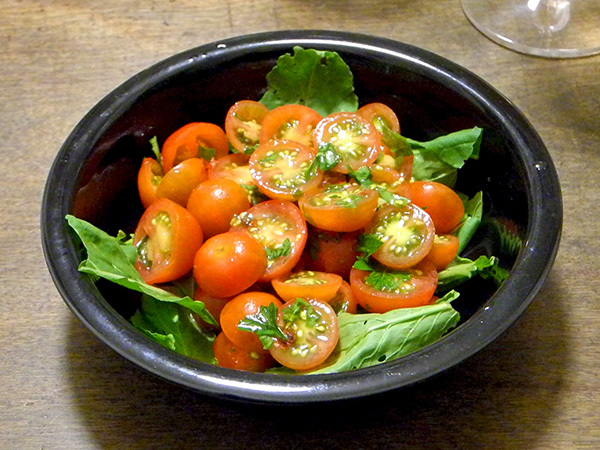 Although primi, before the primi (which in this case had no secondo), we enjoyed a simple salad of tomatoes and herbs. I was originally not going to write about this meal. Even though it would seem to have been a good candidate for publication, if for no other reason than its modest exoticism on these shores, I wasn’t feeling well while I was putting it together, and I didn’t think much better of it once I was done. I think I was too out of it to judge its merits, but Barry said at the time that he liked it, and when I had a taste of some leftovers today, two days later, I decided that, even still cold from the refrigerator, it was actually very good; In fact I’d say it was delicious. I’ve decided the pasta that remains will be the primi in our dinner this evening, a meal featuring grey sole and grilled ‘pink’ plum tomatoes. 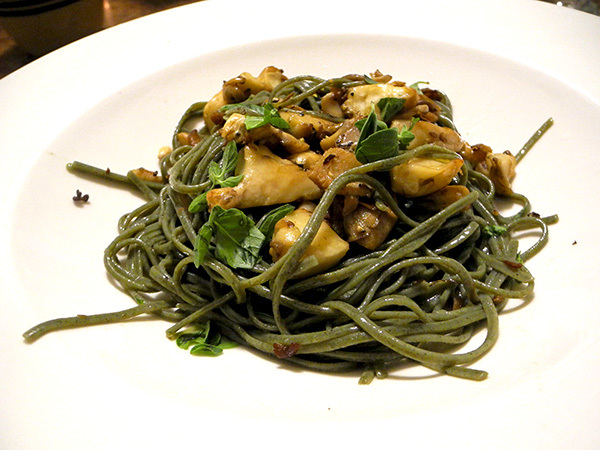 I had a good photograph of the dish, and I remembered how I had assembled it, so I decided to include ‘nettle tagliolini with oyster mushrooms’ in a post after all. Unfortunately neither of us can remember the music we listened to while eating, so feel free to hum whatever tune you wish while reading this. Very simple, pretty classic, and perfect. 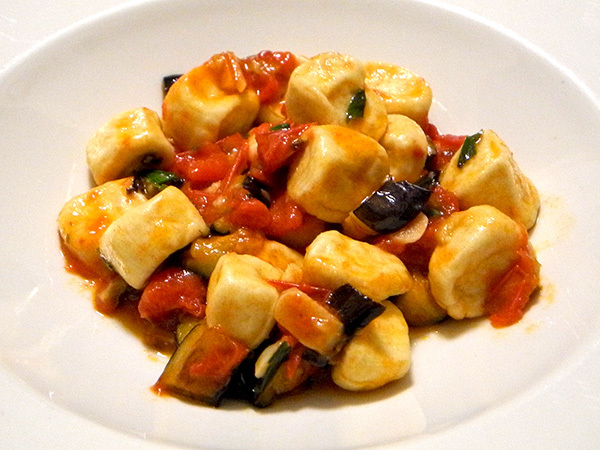 The sauce was conventional, at least by Italian convention, but it was combined with the very best gnocchi I have ever had, anywhere, so it had to be the really wonderful handmade little potato dumplings that made the dish so great. I’ve been dealing with a really bad head cold over the last two days, so on the first of them I had produced a not particularly good meal (I’m now thinking that a combination of nettle pasta and oyster mushrooms really needs a clear head in order to succeed); for the second, I had avoided even trying to cook (an excellent pizza source is our go-to in such cases). But I took a chance today, buoyed in the perhaps ill-judged confidence that my condition could only improve, and that, in any event, there was no way that I wouldn’t be able to put together a pretty simple sauce for a very good fresh prepared pasta I might pick up at Eataly while I was in the neighborhood. I still have the cold, but I’m feeling much better now. 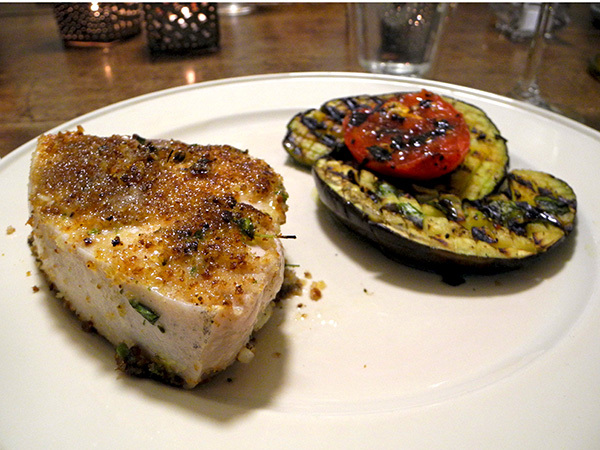 The swordfish recipe is a Sicilian masterpiece, the vegetables were also Italian, and treated as such, perhaps in a generally mid-peninsular manner; the wine was from La Marche, and the music was Lombardy-Venetian. The table was Chelsean. I don’t think I’ve ever before prepared swordfish in the Sicilian style (Trancia di Pesce Spada alla Siciliana), as described by Kyle Phillips, but I now regret my neglect, and I resolve to make up for it, but with the inclusion, whenever possible, of the very American ingredient, ramp fruit.